In the tradition of New Mexican woodworkers, dating back over 400 years, our team of craftsmen has an unsurpassed understanding of the furniture making process. Their old-world techniques and skills, together with an enviable passion for their work, are what separate Ernest Thompson from every other furniture company. Carved within each piece of Ernest Thompson furniture is the history of centuries past, giving you heirlooms that will live on for generations. Using the same techniques as furniture artisans have used for generations, our expert craftsmen produce unique works of art, each one different in style, materials, detailing and finishes. 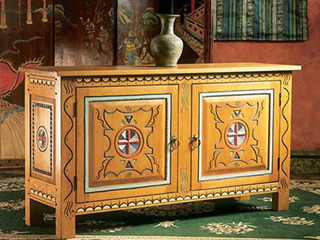 Their incomparable workmanship is treasured in homes, offices, companies, and resorts around the world. See, Feel And Experience The Ernest Thompson Difference.